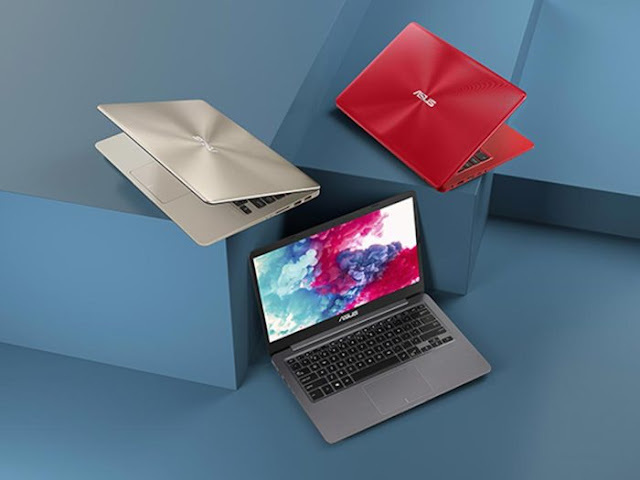 ASUS Launches Vivobook 14 A411UF as a Multi-Function Laptop - Hello friend Movoty Blog | MOVe On to TechnologY at Movoty.com. On this article you read this time with the title ASUS Launches Vivobook 14 A411UF as a Multi-Function Laptop , We have prepared this article well for you to read and take the information in it. hopefully the contents of the post Articles asus, Articles laptop, Articles News, Articles Technology, Articles vivobook, That we write this you can understand. okay, happy reading. ASUS is renewing their VivoBook product line in the Indonesian market. After presenting the VivoBook Flip 14 and VivoBook S14 last year, this time the Taiwanese manufacturer presented another model, but still in the 14-inch laptop segment, which was most widely chosen by users throughout the country. Unlike the previous variant of the VivoBook 14 which is more targeted at the convertible segment or performance, the new model is presented more to the mainstream user segment, but still comes with a very capable performance in its class. This laptop is present for mainstream users. So it is more general and suitable for daily activities, without demands for certain needs. To support storage capacity and performance, the ASUS VivoBook 14 A441UF uses dual-storage design that combines data transfer speeds from SSD devices, as well as the broad capacity typically offered by hard drives. This solution is ideal if the laptop will be used as a daily computing device and also entertainment. This latest laptop from ASUS comes with a screen that has a thin frame. With NanoEdge, ASUS can achieve a ratio of screen and body ratio to 77%. So that the 14-inch screen can be present on a 13-inch laptop body. More concise but more functional and pleasing to the eye. In order to improve performance further, the ASUS VivoBook 14 also supports the Intel Optane memory technology feature that can accelerate system performance for faster multitasking, shorter boot-up and resume time and faster application loading. The ASUS VivoBook 14 A411UF comes with an Intel Core i5-8250U processor with speeds up to 3.40GHz. In addition to users who have a limited budget, can choose the A411UF Core i5 variant without using an SSD, or which is powered by an Intel Core i3 processor that works at 2.4 GHz speed. That's an article ASUS Launches Vivobook 14 A411UF as a Multi-Function Laptop This article will be useful for you all. okay, see you in other article posting. Do not forget to keep visiting on Movoty Blog | MOVe On to TechnologY at Movoty.com.